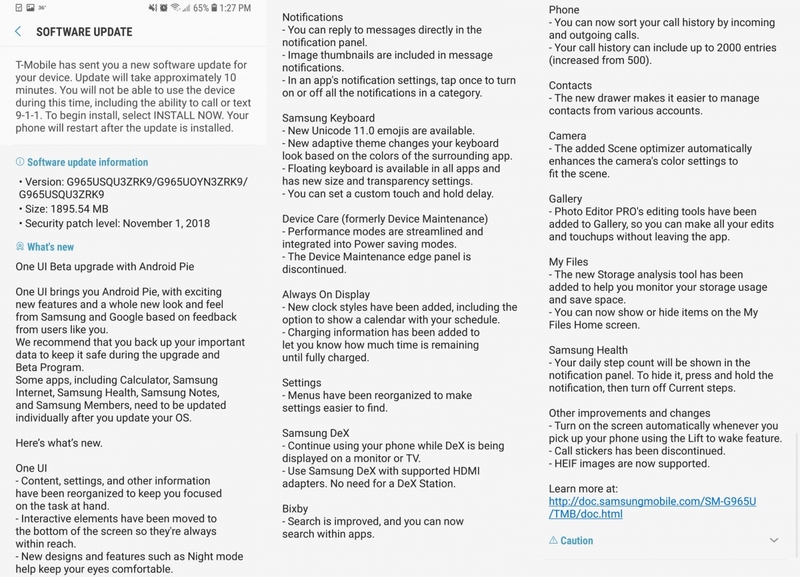 The Galaxy S9 One UI (Android Pie) beta program has gone live in the US, a few hours after it debuted in South Korea. The Germany release of the beta seems to have been delayed, as confirmed to us by Samsung’s customer support (yes, Samsung support representatives were misinformed… again). Germany should, however, get it before the week is over. Or, well, perhaps by the launch of the beta program in the UK on November 20. In the US, the beta program is available for T-Mobile and Sprint customers and to those using an unlocked Galaxy S9 or S9+. It’s not known whether other carriers will run the beta test as well. To register in the program, you will need to open the Samsung+ app and tap the notice that says “One UI with Android 9.0 on Galaxy S9/S9+.” The update can then be downloaded by going into the Settings app on the phone, tapping Software update, then hitting the Download updates manually option. Thanks to the US release, we now have a changelog for the update. There are plenty of changes and new features in addition to the various visual changes brought by One UI. Some of the new features include new adaptive themes for the keyboard that change based on the app you’re currently using, charging information in Always On Display, Scene Optimizer for the Camera app (Flaw Detection should come as well with a future update), and the ability to run DeX with a USB Type-C to HDMI cable while also being able to use the phone when DeX mode is active. 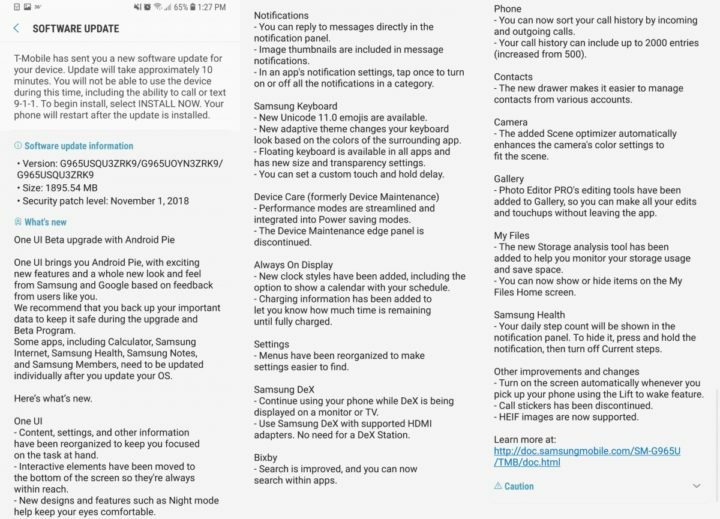 The November 2018 security patch is included as well. The update is a nearly 2GB download over the air, so it’s best to get it over a Wi-Fi connection. And remember, should you choose to enroll and then want to go back to Android Oreo, a data wipe will be required. Make sure to backup all important data before going ahead using Samsung Smart Switch. Have you managed to enter the beta program? According to the German Samsung hotline, the beta will start today or on Monday, because they needed to rework the firmware, because Germany has an other network. Tmobile US tells me it’s only for Unlocked Samsung S9+ Phones. Does that sound right? I’m on jump. If I have it unlocked, will I get the Beta? I’m on Tmobile on the Dallas area. I’ve got the latest Plus app. I’ve still seen no notification. Has anyone received the invite for the German version? Added to the article, cheers! Did you go to the PlayStore and update your apps? I received a new version of the Samsung+ app. Once I opened it, I could see the beta registration. I’m on Sprint S9 and I have not seen a notification.